Let's run through what's involved in getting them and trying some of the new features. As I mentioned in my last post, ASP.NET has moved from a "big thing" that you install every few years. The ASP.NET project templates are now mostly a collection of composable NuGet packages, which can be updated more frequently and used without needing to install anything that will affect your dev environment, other projects you're working on, your server environment, or other applications on your server. You don't need to wait for your hosting provider to support ASP.NET MVC 5.1, ASP.NET Web API 2.1 or ASP.NET Web Pages 3.1 - if they supported 5/2/3 they support 5.1/2.1/3.1. Easier said, if your server supports ASP.NET 4.5, you're set. However, there are some new features for ASP.NET MVC 5.1 views that require you to be running the most recent Visual Studio update to get editing support. 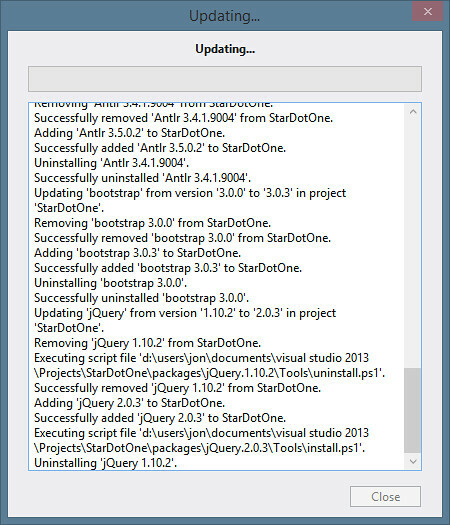 You're installing the Visual Studio updates when they come out so that's not a problem, right? 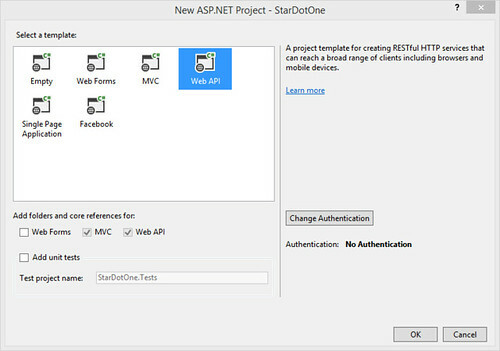 For Visual Studio 2012, you should have ASP.NET and Web Tools 2013.1 for Visual Studio 2012. 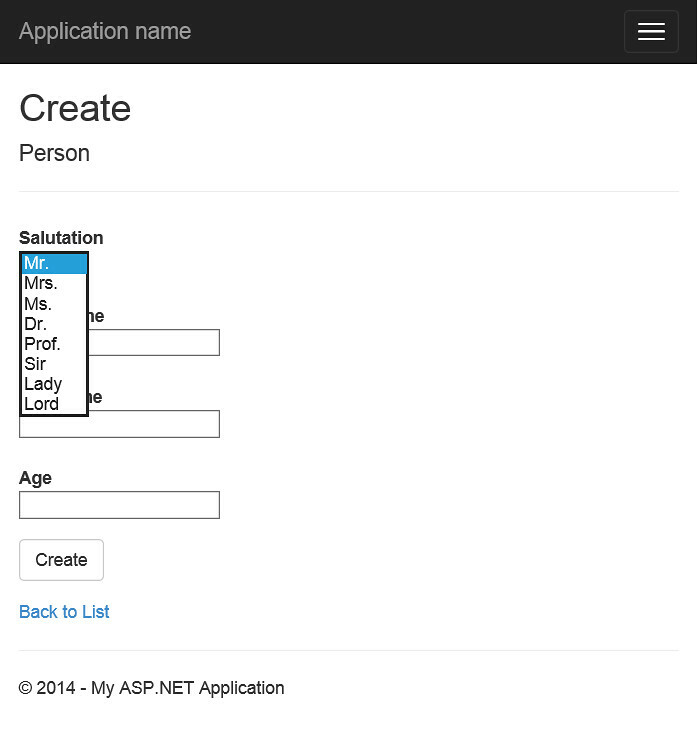 You'd need this for ASP.NET MVC 5 support in Visual Studio 2012, so no real change there. For Visual Studio 2013, you should have Visual Studio 2013 Update 1. This update is needed to get nice editor support for the new ASP.NET MVC 5.1 Razor View features (e.g. Bootstrap overloads). Game plan: I'm going to take an ASP.NET MVC 5 + Web API 2 project, update the NuGet packages, and then throw some of my favorite features in there. In this case, I'm opting for the "mostly Web API template" since it includes both MVC and Web API, and it includes help pages right out of the box. I could go with "mostly MVC" + Web API, but then I'd need to install the Web API Help Page NuGet package and I might strain a muscle. 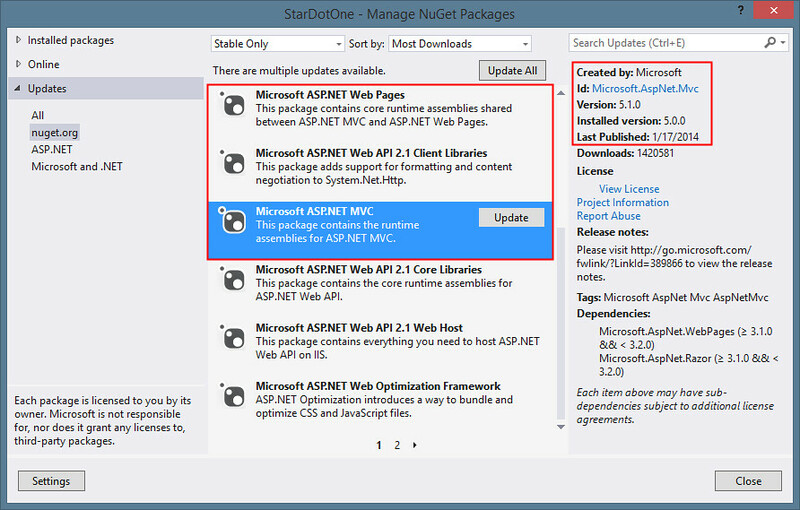 Now I'll open the Manage NuGet Packages dialog and check for updates. Yup, there they are. Wow, look at them go! jQuery 2.0.3 even. It's a party. (anti-party disclaimer for those who might be getting carsick: I didn't have to update to jQuery 2.0.3 or any of that other stuff to use the 5.1/2.1 stuff). Note that I'm using the Display attribute on a few that I want to abbreviate. 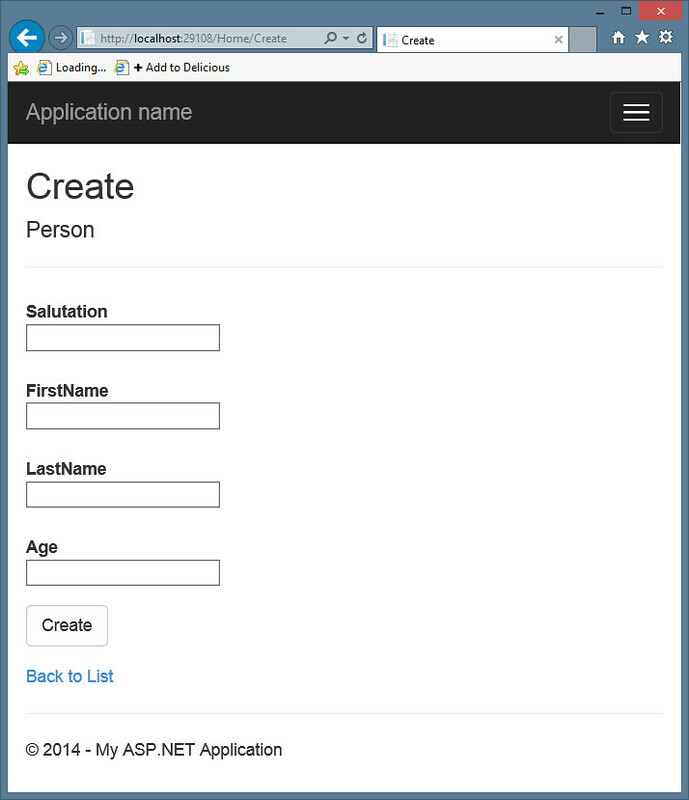 Next, I delete my HomeController and views and scaffold a new HomeController using the Person class. Caution to the wind being our theme, I'll run it. Oh no! 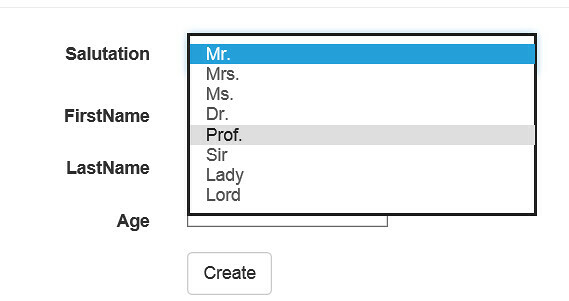 No dropdown on Salutation! Just kidding. That's to be expected. To get the dropdown, we need to change the scaffolded view code for the Salutation from the generic Html.EditorFor to use the new Html.EnumDropDownListFor helper. "Now, Jon," you say, "That's really nice, but it would have been absolutely perfect if the scaffolder or EditorFor or something had seen the Enum property and just done the right thing." And I'll change my Create.cshtml view back how it was originally scaffolded, using Html.EditorFor. That way the view engine will look for a matching EditorTemplate for the object type, find Enum.cshtml, and use that to render all Enum model properties. Hi Jon. All looks very good. However, I seem to have problem with MVC 5 on both vs 2012 and vs 2013 - when adding a View, you are unable to see an external referenced data class library in the Modell drop-down. If you put the data class library in the projects Model directory, everything works as expected. I have entered this as a Connect bug, but have had no response yet. Any ideas? @hamteksoftware Can you give me the link to the Connect issue?